孔繁菲, 马剑, 丛蓉, 杨慧, 冷洪锐, 马晓欣. miR-497-5p在子宫内膜病变组织中的表达及临床意义[J]. 中国医科大学学报, 2018, 47(7): 593-596, 600. KONG Fanfei, MA Jian, CONG Rong, YANG Hui, LENG Hongrui, MA Xiaoxin. Expression of miR-497-5p in Endometrial Lesions and Its Clinical Significance[J]. Journal of China Medical University, 2018, 47(7): 593-596, 600. Abstract: Objective To investigate miR-497-5p expression in different endometrial lesions, determine its relationship with clinicopathological parameters, and explore its clinical significance. Methods miR-497-5p expression in 110 cases of endometrial carcinoma, 20 cases of atypical endometrial hyperplasia, and 30 normal endometria was detected by in situ hybridization. Results The frequency of positive miR-497-5p expression was lower in endometrial carcinoma and atypical hyperplasia than in normal endometrial tissues. 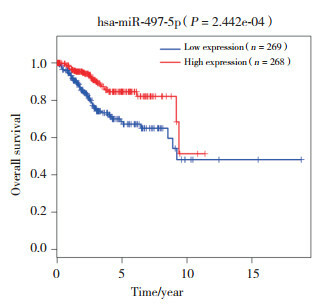 miR-497-5p expression was associated with the clinical stage(P < 0.001), differentiation level(P < 0.001), tumor invasion depth(P=0.039), and lymph node metastasis(P=0.022). Survival analysis conducted on data from the TCGA database revealed a better prognosis of patients with endometrial cancer overexpressing miR-497-5p(P < 0.05). 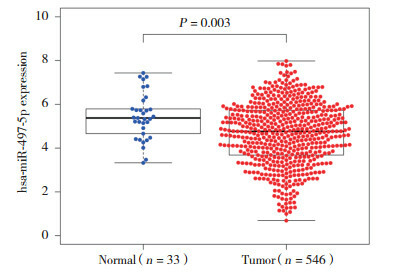 Conclusion miR-497-5p expression is significantly decreased in endometrial carcinoma tissues, indicating its utility as a prognostic marker in patients with endometrial cancer.